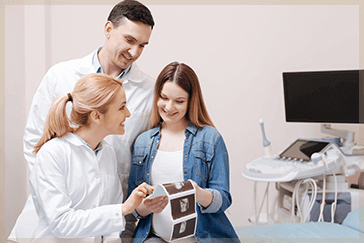 At Mission Obstetrics and Gynecology, we take pride in offering preconception planning and prenatal care to make sure you are as healthy as possible before becoming pregnant. Our high standard of care continues for you and your baby throughout your pregnancy and delivery. Additionally, our female obstetricians have the expertise and experience that high-risk pregnancy and multiple births require. As women and professionals, the caring female doctors at Mission OB GYN are here to discuss all of your concerns and provide you with prompt, compassionate care. We look forward to welcoming your new baby into the world. Please call our office at (586) 574-1313 to schedule an appointment for preconception planning, pregnancy testing, or prenatal care. Mission Obstetrics and Gynecology knows that a healthy pregnancy starts with good prenatal care both before and during pregnancy. Prenatal care can detect and treat problems early, help prevent complications, and allow us to refer you to appropriate specialists if necessary. If you are thinking about becoming pregnant, suspect that you may be pregnant, or are pregnant, please schedule a visit for prenatal care by calling Mission Obstetrics and Gynecology at (586) 574-1313 or request an appointment online. The female obstetricians at Mission OB GYN have the compassion and expertise to help make your pregnancy and delivery as easy as possible. You will receive regular check-ups to monitor your health, as well as the health of your developing baby. We will provide you with education and healthy pregnancy tips along the way. We welcome your questions and take the time to discuss them with you thoroughly. We look forward to delivering and welcoming your precious baby into the world! High-risk pregnancies carry more risks to the mother and developing baby. A pregnancy may be deemed high-risk if you have a pre-existing medical condition or develop one during pregnancy. All pregnancies in women over the age of 35 are considered high risk. With careful monitoring and management, most women with high-risk pregnancy deliver healthy babies, and at Mission Obstetrics and Gynecology, we are committed to doing just that. You can count on the caring female doctors at Mission OB GYN to understand reproductive disorders. Our obstetricians possess the expertise and specialized training to perform infertility work-ups to help identify and treat your reproductive health problem. If you are concerned about not being able to get pregnant or having a miscarriage, schedule an appointment to meet with our experts. Call (586) 574-1313 or request one online.